GO Alpine strongly encourages the citizens of Steamboat Springs to vote Yes2Air on Referendum 2A in support of the success of the flight program at the Yampa Valley Regional Airport. The funds generated by this small tax are necessary to maintain and increase flight service at the airport. Our local economy and jobs depend on tourism dollars. Everyone living in the Yampa Valley benefits in some way from the flight program. 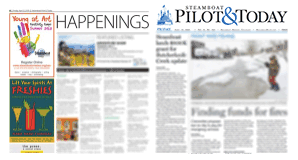 Air service is vital to the financial wellbeing and economic success of Steamboat Springs. Twenty cents on $100 that citizens and visitors spend on goods is a small price to pay to keep our economy strong and healthy.